Western Belorussia or Western Belarus (Belarusian: Заходняя Беларусь: Zachodniaja Biełaruś; Polish: Zachodnia Białoruś; Russian: Западная Беларусь: Zapadnaja Belorussija;) is a historical region of modern-day Belarus comprising the territory which belonged to the Second Polish Republic during the interwar period in accordance with the international peace treaties. Before the 1939 Nazi-Soviet invasion of Poland it used to form the northern part of the Polish Kresy macroregion. Following the end of World War II in Europe the territory of Western Belorussia was ceded to the Soviet Union by the Allied Powers, while the city of Białystok with surroundings was returned to Poland. Until the dissolution of the Soviet Union in 1991 Western Belorussia formed a significant part of the Byelorussian Soviet Socialist Republic (BSSR). Today, it constitutes the western part of the sovereign Republic of Belarus. Created by the USSR after the conquest of Poland, the new western provinces of Byelorussian SSR acquired from Poland included Baranavichy (Барановичская об. ), Belastok (Белостокская об. ), Brest (Брестская об. ), Vileyka (Вилейская об. ), and the Pinsk Region (Пинская об.). They were reorganized one more time during the Soviet counteroffensive of 1944 into the contemporary western provinces of Belarus which include all of Grodno (Hrodna) and Brest voblasts (see map), as well as parts of today's Minsk and Vitsebsk voblasts. The city of Wilno (Belarusian: Вільня, Vilnia, today's Vilnius) was returned by the USSR to the Republic of Lithuania which soon after that became the Lithuanian SSR. Outline of the Polish–Lithuanian Commonwealth before the Partitions of Poland in 1772, 1793, and 1795, overlaid with the outline of the Second Republic (1918–1939). Most territories annexed by the Russian Empire during the partitions (in shades of green) remained in the Soviet Union after World War I. The territories of contemporary Belarus, Poland, Ukraine, and the Baltic states were a major theatre of operations during World War I; all the while, the Bolshevik Revolution overturned the interim Russian Provisional Government and formed the Soviet Russia. The Bolsheviks withdrew from the tsarist war with the Central Powers by signing the Treaty of Brest-Litovsk, and ceded Belarus to Germany for the next eight and a half months. The German high command used this window of opportunity to transfer its troops to the Western Front for the 1918 Spring Offensive, leaving behind a power vacuum. The non-Russians, who inhabited the lands given by the Soviets to imperial Germany, saw the treaty as an opportunity to set up independent states under the German umbrella. Three weeks after the Treaty of Brest-Litovsk was signed on 3 March 1918 the newly formed Belarusian Central Council declared the founding of the Belarusian People's Republic across the territory of modern-day Belarus. The idea was rejected by the Germans and by the Bolsheviks as well. For the American delegation led by Wilson, this was also unacceptable; the Americans intended to protect the territorial integrity of European Russia. The fate of the region was not settled for the following three and a half years. The Polish–Soviet War which erupted in 1919 was particularly bitter; it ended with the Treaty of Riga signed in 1921. Poland and the Baltic states emerged as independent countries opposite the USSR. The territory of modern-day Belarus was split by the treaty into the Polish Western Belorussia and the Soviet Eastern Belorussia, with the border town in Mikaszewicze. Notably, the peace treaty was signed with the full active participation of the Belarusian delegation on the Soviet side. Poland abandoned all rights and claims to the territories of Soviet Belarus (paragraph 3), while the Soviet Russia abandoned all rights and claims to Polish Western Belarus. As soon as the Soviet-German peace treaty was signed in March 1918, the newly formed Rada of the Belarusian Democratic Republic laid territorial claims to Belarus based on areas specified in the Third Constituent Charter unilaterally as inhabited by the Belarusian majority. The same Rada charter also declared that the Treaty of Brest-Litowsk of March 1918 was invalid because it was signed by foreign governments partitioning territories which were not theirs. In the Second Constituent Charter the Rada abolished the right to private ownership of land (paragraph 7) in line with the Communist Manifesto. Meanwhile, by 1919 the Bolsheviks took control over large parts of Belarus and forced the Belarusian Rada into exile in Germany. The Bolsheviks formed the Soviet Socialist Republic of Belarus during the war with Poland on roughly the same territory claimed by the Belarusian Republic. The new Polish-Soviet border was internationally recognized as well as ratified by the League of Nations. The peace agreement remained in place throughout the interwar period. 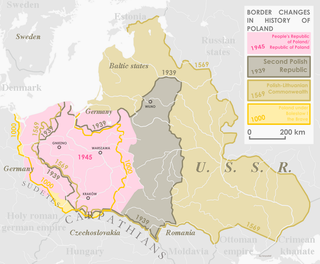 The borders established between the two countries remained in force until the outbreak of World War II, and the 17 September 1939 Soviet invasion of Poland. They were later redrawn during the Yalta Conference and the Potsdam Conference on the insistence of Joseph Stalin. "Despite Soviet efforts at sealing the border [with Poland], peasants – refugees from the BSSR – crossed into Poland in the tens of thousands, wrote Per Anders Rudling. According to the first Polish national census of 1921, there were around 1 million Belarusians in the country. Some estimates put the number of Belarusians in Poland at that time to be perhaps 1.7 million, or even up to 2 million. In the years that followed the Peace of Riga thousands of Poles settled in the area, many of them (including veterans of armed struggle for Poland's independence) were given land by the government (see: Osadniks). In his negotiations with the Belarusian leaders in Wilno Józef Piłsudski rejected the call for Western Belorussian independence. In December 1919 the Rada was dissolved by Poland and instead, by early January 1920 a new body was formed called Rada Najwyższa without aspirations for independence, but with proposed cultural, social and educational functions. Józef Piłsudski negotiated with the Western Belorussian leadership, but eventually abandoned the ideas of Intermarium, his own proposed federation of partially self-governing states on the lands of the former Polish-Lithuanian Commonwealth. In the Polish legislative elections of November 1922, the Belarusian party in the Blok Mniejszości Narodowych coalition obtained 14 seats in the Polish parliament (11 of them in the Sejm). In the spring of 1923, Polish prime minister Władysław Sikorski ordered a report on the situation of the Belarusian minority in Poland. That summer, a new regulation was passed allowing for the Belarusian language to be used officially both in courts and in schools. Obligatory teaching of the Belarusian language was introduced in all Polish gymnasia in areas inhabited by Belarusians in 1927. The Belarusian population of West Belarus faced active polonisation promoted by the central Polish authorities. The policy included pressure on Belarusian schooling, widespread cases of discrimination of the Belarusian language, imposition of Polish national identity on Belarusian Roman Catholics. In January 1921, the starosta from Wilejka wrote of the popular mood as being one of resignation and apathy among the peasants in Western Belorussia, impoverished by requisitions of food by the Bolsheviks as well as the Polish military. He insisted that, although the new Belorussian schools were 'springing up everywhere' in his county, they harbored anti-Polish attitudes. In 1928 there were 69 schools with Belarusian language in Western Belorussia; the attendance was minimal due in part to lower quality of instruction. The first-ever textbook of Belarusian grammar was written only around 1918. In 1939, over 90% of children in Poland attended school. As elsewhere, the educational systems promoted Polish language there also. Meanwhile, the Belarusian agitators deported to the USSR from Poland were put in prison by the Soviet NKVD as bourgeois nationalists. Most Polish inhabitants of the region supported the policy of cultural assimilation of Belarusians as proposed by Dmowski. The polonization drive was inspired and influenced by the Polish National Democracy, led by Dmowski, who advocated refusing Belarusians and Ukrainians the right for a free national development. Władysław Studnicki, an influential Polish official at the administration of the Kresy region in 1919-1920 stated that Poland's engagement in the East amounts to a much needed economic colonization. Belarusian nationalist media in Poland faced increased pressure and censorship from the authorities. Belarusians were divided along religious lines with roughly 70 percent being Orthodox and 30 percent Roman Catholic. According to Russian sources, discrimination was targeting assimilation of Eastern Orthodox Belarusians. The Polish church authorities were promoting Polish language in Orthodox services, and initiated the creation of the Polish Orthodox Societies in four cities including Słonim, Białystok, Wołkowysk, and Nowogródek. The Belarusian Roman Catholic priest Fr. Vincent Hadleŭski who promoted Belarusian in church, and Belarusian national awareness, was under pressure by his Polish counterparts. The Polish Catholic Church in Western Belorussia issued documents to priests about the usage of the Belarusian language rather than Polish language in Churches and Catholic Sunday Schools. The Warsaw-published instruction of the Polish Catholic Church from 1921 criticized priests preaching in Belarusian at the Catholic masses. Compared to the (larger) Ukrainian minority living in Poland, Belarusians were much less politically aware and active. The largest Belarusian political organization was the Belarusian Peasants' and Workers' Union, also referred to as the Hramada. Hramada received logistical help from the Soviet Union and the Communist International and served as a cover for the radical and subversive Communist Party of Western Belorussia. It was therefore banned by the Polish authorities, its leaders were sentenced to various terms in prison and then handed out to the USSR, where they were killed by the Soviet regime. Tensions between the increasingly nationalistic Polish government and various increasingly separatist ethnic minority groups continued to grow, and the Belarusian minority was no exception. Likewise, according to Marek Jan Chodakiewicz, the USSR considered Poland to be "enemy number one". During the Great Soviet Purge, the Polish Autonomous District at Dzyarzhynsk (Polish: Kojdanów) was disbanded and the Soviet NKVD undertook the so-called "Polish Operation" (from approximately August 25, 1937 to November 15, 1938) – a program of deportation and shootings that targeted Poles in East Belorussia, i.e. the BSSR. The operation caused the deaths of to 250,000 people – out of an official ethnic Polish population of 636,000 – as a result of political murder, disease or starvation. Amongst these, at least 111,091 members of the Polish minority were shot by NKVD troykas. Many were murdered in prison executions, according to Bogdan Musial. In addition, several hundred thousand ethnic Poles from Belarus and Ukraine were deported to other parts of the Soviet Union. The Soviets also promoted the Soviet-controlled BSSR as formally autonomous, in order to attract Belarusians living in Poland. This image was attractive to many Western Belorussian national leaders and some of them, like Francišak Alachnovič or Uładzimir Žyłka emigrated from Poland to the BSSR, but very soon became victims of Soviet repression. Animated map of the 1939 invasion of Poland. Soviet order of battle marked in dark pink. Polish families deported to Siberia after the Soviet annexation of the eastern regions of the Second Polish Republic. Soon after the Nazi-Soviet invasion of Poland in accordance with the Nazi–Soviet Pact, the area of Western Belorussia was formally annexed into the Belarusian Soviet Socialist Republic (BSSR). The Soviet secret police NKVD, aided by the Red Army, organized staged elections which were decided in the atmosphere of intimidation and state terror. The Soviet occupational administration held the elections on October 22, 1939, less than two weeks after the invasion. The citizens were threatened repeatedly that their deportations to Siberia were imminent. The ballot envelopes were numbered so as to remain traceable, and usually handed over already sealed. The referendum was rigged. By design, the candidates were unknown to their constituencies which were brought to the voting stations by armed guards. The so-called Elections to the People's Assemblies of Western Ukraine and Western Belorussia were conducted in Russian. On October 30, the People's Assembly session held in Belastok (Polish Białystok) affirmed the Soviet decision to join the Belarusian Soviet Socialist Republic (BSSR) with the USSR. The petition was officially accepted by the Supreme Soviet of the USSR on November 2 and by the Supreme Soviet of the BSSR on November 12, 1939. From then on, all citizens of Poland but also born in Poland would find themselves living in the Byelorussian SSR as the Soviet subjects, without the recognition of their Polish citizenship. The Soviet invasion of Poland was portrayed by the Soviet propaganda as the "liberation of Western Belorussia and Ukraine". Many ethnic Belarusians welcomed unification with the BSSR. They changed their attitude after experiencing firsthand the terror of the Soviet system. The Soviets quickly began confiscating, nationalizing, and redistributing all private and state-owned Polish property. During the two years following the annexation, the Soviets arrested approximately 100,000 Polish citizens across Kresy. Due to a lack of access to the secret Soviet and Belorussian archives, for many years after the war the estimates of the number of Polish citizens deported to Siberia from the areas of Western Belorussia, as well as the number who perished under Soviet rule, were only estimated. In August 2009, on the occasion of the 70th anniversary of the Soviet invasion, the authoritative Polish Institute of National Remembrance announced that its researchers reduced the estimate of the number of people deported to Siberia to 320,000 in total. Some 150,000 Polish citizens perished under the Soviet rule. The terms of the Molotov–Ribbentrop Pact signed earlier in Moscow were soon broken, when the German Army entered the Soviet occupation zone on June 22, 1941. After Operation Barbarossa, most of Western Belorussia became part of the German Reichskommissariat Ostland (RKO), as the so-called Generalbezirk Weißruthenien (General Region of White Ruthenia). Many ethnic Belarusians supported Nazi Germany. By the end of 1942, sworn Germanophile Ivan Yermachenka formed the pro-Nazi BNS organization with 30,000 members. The Belarusian Auxiliary Police was formed. Known to the Germans as the Schutzmannschaft, the ethnic Belarusian police played an indispensable role in the Holocaust in Belarus, notably during the second wave of the ghetto liquidations, starting in February–March 1942. Two years later, during the Soviet counteroffensive, Joseph Stalin insisted at the Tehran Conference of 1943 – to which the Allies formally agreed again at Yalta – that most of Western Belorussia would remain part of the BSSR after the end of World War II in Europe. Only the region around Białystok (Belostok, Biełastok) was to be returned to Poland. The Polish population was soon expelled and forcibly resettled west. The Western Belorussia, in its entirety, was incorporated into the BSSR. It was initially planned to move the capital of the BSSR to Vilna. However, the same year Joseph Stalin ordered that the city and surrounding region be transferred to Lithuania, which some months later was annexed by the Soviet Union and became a new Soviet Republic. Minsk therefore remained the capital of the enlarged BSSR. The borders of the BSSR were again altered somewhat after the war (notably the area around the city of Białystok (Belastok Voblast) was returned to Poland) but in general they coincide with the borders of the modern Republic of Belarus. Residents of a town in Eastern Poland (now Western Belorussia) assembled to greet the arrival of the Red Army during the Soviet invasion of Poland in 1939. The Russian text reads "Long Live the great theory of Marx, Engels, Lenin-Stalin". Such welcomings were organized by the activists of the Communist Party of West Belarus affiliated with the Communist Party of Poland, delegalized in both countries by 1938. The Belarusian political parties and the society in Western Belorussia often lacked information about repressions in the Soviet Union and was under strong influence of Soviet propaganda. Because of bad economic conditions and national discrimination of Belarusian in Poland, much of the population of Western Belorussia welcomed the annexation by the USSR. However, soon after the annexation of Western Belorussia by the Soviet Union, the Belarusian political activists had no illusions as to the friendliness of the Soviet regime. The population grew less loyal as the economic conditions became even worse and as the new regime carried out mass repressions and deportations that targeted Belarusians as well as ethnic Poles. Immediately after the annexation, the Soviet authorities carried out the nationalization of agricultural land owned by large landowners in Western Belorussia. Collectivization and the creation of collective farms (kolkhoz) was planned to be carried out on a more slow pace than in Eastern Belorussia in the 1920s. By 1941, in the western regions of the BSSR the number of individual farms decreased only by 7%; 1115 collective farms were created. At the same time, pressure and even repressions against larger farmers (called by the Soviet propaganda, kulaki) began: the size of agricultural land for one individual farm was limited to 10ha, 12ha and 14ha depending on the quality of the land. It was forbidden to hire workers and to lease land. Under the Soviet occupation, the Western Belorussian citizenry, particularly the Poles faced a "filtration" procedure by the NKVD apparatus, which resulted in over 100,000 people forcibly deported to eastern parts of the Soviet Union (e.g. Siberia) in the very first wave of expulsions. In total, during the next two years some 1.7 million Polish citizens were put on freight trains and sent from the Polish Kresy to labour camps in the Gulag. ^ a b c d Prof. Anna M. Cienciala (2004). "The Rebirth of Poland". History 557: Poland and Soviet Russia: 1917-1921. The Bolshevik Revolution, the Polish-Soviet War, and the establishment of the polish-soviet frontier. University of Kansas (Lecture Notes 11 B). Retrieved 31 July 2016 – via Internet Archive. ^ a b Piotr Eberhardt; Jan Owsinski (2003). Ethnic Groups and Population Changes in Twentieth-century Central-Eastern Europe: History, Data, Analysis. M.E. Sharpe. pp. 199–201. ISBN 978-0-7656-0665-5. ^ Александр Локотко; Ольга Князева; Евгений Морозов; Ольга Изотова (2017). Mosaic of Belarus. Litres. p. 425. ISBN 5457636631. ^ Algimantas P. Gureckas, Lithuania's Boundaries and Territorial Claims between Lithuania and Neighboring States, New York Law School Journal of International and Comparative Law, New York Law School, New York, 1991, Vol.12, Numbers 1 & 2, p. 126-128. ^ Marjorie M. Whiteman, ed., Digest of International Law, Department of State Publication 7737, Washington, DC, 1964, Vol.3, p. 185-186 & 190. ^ Ronen, Yaël (2011). Transition from Illegal Regimes Under International Law. Cambridge University Press. p. 17. ISBN 978-0-521-19777-9. ^ a b Ruth Fischer (2006) . Stalin and German Communism. Transaction Publishers. pp. 32, 33–36. ISBN 1412835011. ^ Smithsonian (2014). World War I: The Definitive Visual History. Penguin. p. 227. ISBN 1465434909. ^ Janusz Cisek (2002). Kosciuszko, We Are Here! : American Pilots of the Kosciuszko Squadron in Defense of Poland, 1919-1921. McFarland. p. 91. ISBN 0786412402. ^ a b Michael Palij (1995). The Ukrainian-Polish Defensive Alliance, 1919-1921: An Aspect of the Ukrainian Revolution. CIUS Press. p. 165. ISBN 1895571057. ^ Tania Raffass (2012). "The roots of the Soviet Federation". 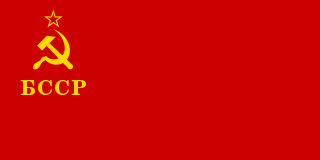 The Soviet Union: Federation Or Empire?. Routledge Studies in the History of Russia and Eastern Europe. p. 44. ISBN 0415688337. ^ Map of the Soviet Socialist Republic of Belarus on JiveBelarus.net website. ^ Rudling, Per Anders (2014). The Rise and Fall of Belarusian Nationalism, 1906–1931. University of Pittsburgh Press. p. 206. ^ Mironowicz, 1999, p. 80. ^ Mironowicz 2007, p. 34, "Białoruska reprezentacja narodowa stojąca na gruncie niepodległości była nie do zaakceptowania przez stronę polską. Rada została rozwiązana w grudniu 1919 r. przez Raczkiewicza na osobisty rozkaz Piłsudskiego. W jej miejsce powołano na początku 1920 r. Białoruską Radę Najwyższą aspirującą wprawdzie do roli reprezentacji narodowej, lecz bez podnoszenia problemu państwowości białoruskiej." ^ a b Mironowicz, 1999, p. 94. ^ Mironowicz 2007, pp. 37–38, [Starosta] "ze stycznia 1921r. mówił o nastrojach miejscowego społeczeństwa: »zupełna rezygnacja i apatia ludności wiejskiej doprowadzonej do zupełnej nędzy przez bolszewików i wojsko polskie ciągłymi rekwizycjami.« Cały powiat pokrył się siecią szkół białoruskich ... zapewniał jednak, że szkoły białoruskie mają antypaństwowy charakter." ^ Mironowicz 2007, p. 72, "W najpomyślniejszym dla szkolnictwa białoruskiego roku 1928 istniało w Polsce 69 szkół w których nauczano języka białoruskiego." ^ Norman Davies (2005). God's Playground. A History of Poland. II: 1795 to the Present. Oxford University Press. p. 175. ISBN 0199253390. ^ Mironowicz 2007, p. 93, W Białorusi Radzieckiej ... aresztowano byłych przywódców Hromady, którzy po opuszczeniu więzień w Polsce zostali przekazani władzom radzieckim w ramach wymiany więźniów politycznych. ^ Mironowicz 2007, p. 34, "Większość Polaków pragnęła łączyć plany nabytków terytorialnych Józefa Piłsudskiego z polityką asymilacyjną proponowaną przez Romana Dmowskiego." ^ Mironowicz 2007, p. 12, "Zaangażowanie Polski na Białorusi i Ukrainie to ekspansja kolonialna, konieczna ze w zględów gospodarczych" (Studnicki). ^ a b c d e f g h i j k l m n Hielahajeu, Alaksandar (17 September 2014). "8 мифов о "воссоединении" Западной и Восточной Беларуси" [8 Myths about the "reunification" of Western Belorussia and Eastern Belorussia] (in Russian). Retrieved 26 July 2016. ^ Andrzej Poczobut; Joanna Klimowicz (June 2011). "Białostocki ulubieniec Stalina" (PDF file, direct download 1.79 MB). Ogólnokrajowy tygodnik SZ «Związek Polaków na Białorusi» (Association of Poles of Belarus). Głos znad Niemna (Voice of the Neman weekly), Nr 7 (60). pp. 6–7 of current document. Retrieved 24 May 2014. ^ Andrew Savchenko (2009). Belarus: A Perpetual Borderland. BRILL. pp. 106–107. ISBN 9004174486. ^ Sanko, Zmicier; Saviercanka, Ivan (2002). 150 пытаньняў і адказаў з гісторыі Беларусі [150 Questions and Answers on the History of Belarus] (in Belarusian). Vilnius: Наша Будучыня. ISBN 985-6425-20-4. ^ a b c d e Marek Jan Chodakiewicz, 2012, Intermarium: The Land between the Black and Baltic Seas, Transaction Publishers, pp. 81–82. ^ a b Prof. Bogdan Musial (January 25–26, 2011). "The 'Polish operation' of the NKVD" (PDF). The Baltic and Arctic Areas under Stalin. Ethnic Minorities in the Great Soviet Terror of 1937-38. University of Stefan Wyszyński in Warsaw. pp. 17–. Retrieved April 26, 2011. UMEA International Research Group. Abstracts of Presentations. ^ O.A. Gorlanov. "A breakdown of the chronology and the punishment, NKVD Order № 00485 (Polish operation) in Google translate". Retrieved April 26, 2011. ^ a b c Wegner, Bernd (1997). From peace to war: Germany, Soviet Russia, and the world, 1939–1941. The period of Soviet-German partnership. Berghahn Books. pp. 74–. ISBN 1571818820. ^ "Сборник документов «Государственные границы Беларуси»" Vol. 2, June 28, 2016 retrieved November 27, 2017. ^ Jan T. Gross (1997). Sovietisation of Poland's Eastern Territories. From Peace to War: Germany, Soviet Russia, and the World, 1939-1941. Berghahn Books. pp. 74–75. ISBN 1571818820. ^ a b Norman Davies, God's Playground (Polish edition), second tome, p.512-513. ^ Marek Wierzbicki. "Polish-Belarusian relations under the Soviet occupation" [Stosunki polsko-białoruskie pod okupacją sowiecką (1939–1941)]. НА СТАРОНКАХ КАМУНІКАТУ. Białoruskie Zeszyty Historyczne (20 (2003)): 186–188 – via Internet Archive. ^ a b Leonid Rein (2013). The Kings And The Pawns. pp. 144–145. ISBN 1782380485. ^ a b Alexey Litvin (Алексей Лiтвiн), Participation of the local police in the extermination of Jews (Участие местной полиции в уничтожении евреев, в акциях против партизан и местного населения. ); (in) Местная вспомогательная полиция на территории Беларуси, июль 1941 — июль 1944 гг. (The auxiliary police in Belarus, July 1941 - July 1944). ^ Martin Dean (2003). Collaboration in the Holocaust: Crimes of the Local Police in Belorussia and Ukraine, 1941-44. Palgrave Macmillan. p. viii. ISBN 1403963711. ^ Andrea Simon (2002). Bashert: A Granddaughter's Holocaust Quest. Atonement. Univ. Press of Mississippi. p. 225. ISBN 1578064813. ^ Andrea Simon (2002). Bashert: A Granddaughter's Holocaust Quest. Univ. Press of Mississippi. p. 228. ISBN 1578064813. ^ (in Polish) Marek Wierzbicki, Stosunki polsko-białoruskie pod okupacją sowiecką (1939–1941). "Białoruskie Zeszyty Historyczne" (НА СТАРОНКАХ КАМУНІКАТУ, Biełaruski histaryczny zbornik) 20 (2003), p. 186–188. Retrieved 16 July 2007. ^ A Forgotten Odyssey 2001 Lest We Forget Productions. Expatica (2009). "Polish experts lower nation's WWII death toll". AFP/Expatica. Karta (2006). "Repressions 1939–1941. Arrested in the Eastern Borderlands" [Represje 1939–41. Aresztowani na Kresach Wschodnich] (in Polish). Ośrodek KARTA Center – via Internet Archive. Mironowicz, Eugeniusz (2007). Belarusians and Ukrainians in the policies of the Piłsudski camp [Białorusini i Ukraińcy w polityce obozu piłsudczykowskiego] (in Polish). Białystok: Wydawnictwo Uniwersyteckie Trans Humana. 'Preface' (pp. 3–31), chpt. 1 (pp. 32–94), chpt. 2 (pp. 95–178), chpt. 3 (pp. 179–257) &c. ISBN 978-83-89190-87-1. Piotrowski, Tadeusz (1998). Poland's Holocaust: Ethnic Strife: Collaboration with Occupying Forces and Genocide in the Second Republic, 1918–1947. Jefferson, NC: McFarland & Company. ISBN 0-7864-0371-3. Rieber, Alfred Joseph (2000). Forced Migration in Central and Eastern Europe: 1939–1950. London, New York: Routledge. ISBN 0-7146-5132-X. Rudling, Per Anders (2015) . The Rise and Fall of Belarusian Nationalism, 1906–1931. University of Pittsburgh Press. ISBN 0822979586. Rudling, Per Anders (2015). "The Beginnings of Modern Belarus: Identity, Nation, and Politics in a European Borderland" (PDF). The Journal of Belarusian Studies. Annual London Lecture on Belarusian Studies. pp. 115–127 (1–13 in PDF), direct download. Żarnowski, Janusz (1973), Społeczeństwo Drugiej Rzeczypospolitej 1918-1939 (in Polish), Warszawa. The Belarusian Central Council or the Belarusian Central Rada was a Belarusian representative body with limited governmental functions during World War II in the German occupied Belarusian SSR. It was established by Nazi Germany within Reichskommissariat Ostland in 1943–44, following a requests by the collaborationist Belarusian politicians hoping to create an independent Belarusian state with support of Nazi Germany. Belastok Voblast or Belostok Oblast was a short-lived territorial unit in the Belarusian Soviet Socialist Republic (BSSR) during World War II from September 1939 until Operation Barbarossa of 22 June 1941. The administrative center of the newly created voblast was the Polish: Białystok renamed Belastok. The Polish minority in Belarus numbers officially about 294,549 according to 2009 census. It forms the second largest ethnic minority in the country after the Russians, at 3.1% of the total population. An estimated 180,905 Belarusian Poles live in large agglomerations and 113,644 in smaller settlements, with the number of women exceeding the number of men by about 33,000. Some estimates by Polish non-governmental sources in the U.S. are higher, citing the previous poll held in 1989 under the Soviet authorities with 413,000 Poles recorded. The Polish population transfers in 1944–46 from the eastern half of prewar Poland, refer to the forced migrations of Poles toward the end – and in the aftermath – of World War II. These were the result of Soviet Union policy that was ratified by its Allies. Similarly the Soviet Union had enforced policy between 1939 and 1941, that targeted and expelled ethnic Poles residing in the Soviet zone of occupation following the Nazi-Soviet invasion of Poland. The second wave of expulsions resulted from the retaking of Poland by the Red Army during the Soviet counter-offensive. It took over territory for its republic of Ukraine, a shift that was ratified at the end of World War II by the Soviet Union's then Allies of the West. The Belarusian Home Defence, or the Byelorussian Home Guard was a name of the collaborationist volunteer battalions formed by the Belarusian Central Council (1943-1944), a pro-Nazi Belarusian self-government within Reichskommissariat Ostland during World War II. 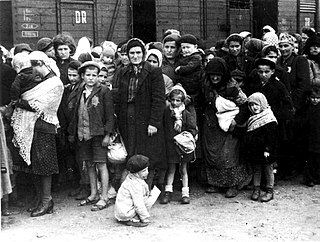 The Holocaust in Belarus in general terms refers to the Nazi crimes committed during World War II on the territory of Belarus against Jews. The borders of Belarus however, changed dramatically following the Soviet invasion of Poland in 1939, which has been the source of confusion especially in the Soviet era as far as the scope of the Holocaust in Belarus is concerned. In the period between 1919 and 1939 Wołkowysk County was part of the Second Polish Republic. It was part of the Białystok Voivodeship and the seat of Gmina Biskupice. The Border Agreement between Poland and the USSR of 16 August 1945 established the borders between the Union of Soviet Socialist Republics (USSR) and the Republic of Poland. It was signed by the Provisional Government of National Unity formed by the Polish communists. According to the treaty, Poland officially accepted the ceding its pre-war Eastern territory to the USSR (Kresy) which was decided earlier in Yalta already. Some of the territory along the Curzon line, established by Stalin during the course of the war, was returned to Poland. The treaty also recognised the division of the former German East Prussia and ultimately approved the finalised delimitation line between the Soviet Union and Poland: from the Baltic sea, to the border tripoint with Czechoslovakia in the Carpathians. Elections to the People's Assemblies of Western Ukraine and Western Belorussia, which took place on October 22, 1939, were an attempt to legitimize the annexation of the Second Polish Republic by the Soviet Union following the September 17 Soviet invasion of Poland in accordance with the secret protocol of the Molotov–Ribbentrop Pact. Only one month after the eastern territories of Poland were occupied by the Red Army, the Soviet secret police and military led by the Party officials staged the local elections in an atmosphere of state terror. The referendum was rigged. The ballot envelopes were numbered and often handed over already sealed. By design, the candidates were unknown to their constituencies which were brought to the voting stations by armed militias. The results were to become the official legitimization of the Soviet takeover of what is known today as the Western Belorussia and the Western Ukraine. Consequently, both Assemblies voted for incorporation of all formerly Polish voivodeships into the Soviet Union.